Monaco by Stanford unveiled our Mercedes V-Class conversion at the London Classic Car Show earlier this month. We have already converted Vito's for our clients into luxurious passenger carrying vehicles. The V-Class and Vito are very similar chassis with the Vito on the commercial side of Mercedes and V-Class on the car side. As commercial vehicle converters this was our first exploration to the Mercedes car side for a conversion. The V-Class is well established as an executive vehicle and is featured on chauffeur fleets. It provides luggage space, generous passenger space, comfortable and looks executive. With this reputation we knew it was time to add the V-Class to the Monaco design portfolio. Our first V-Class demo had to be something unique. We decided to trim the vehicle to a very high spec and focus on this aspect of the design. After all airport runs and city driving you're bound to encounter some traffic so its important you're riding in comfort. The V-Class conversion is a sleek and subtle design. The trim is luxurious, comfortable and tactile in a stylish black on black finish. 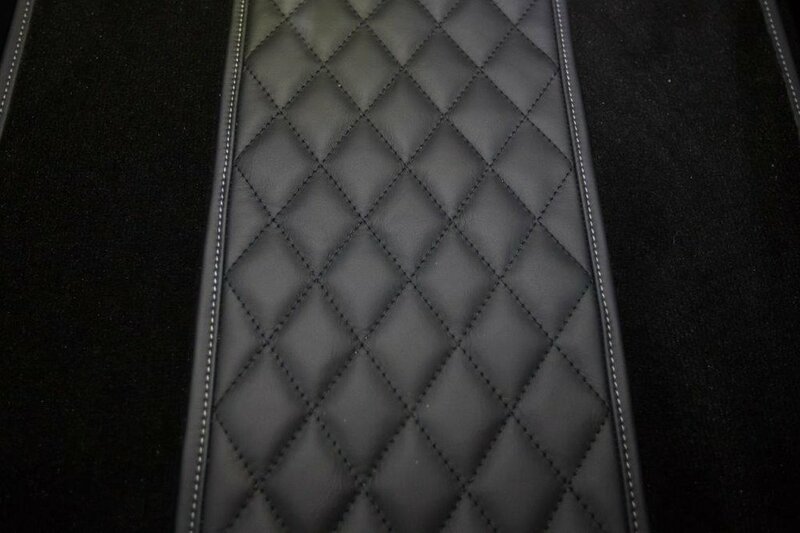 The V-Class features quilted diamond stitching, Alcantara and Nappa leather, with delicate white pencil stitching. We don't just concentrate on the passenger cabin, we also convert the front cab and boot area. The driver and front passenger seats are re-trimmed to compliment the rear seats. The pillars in the front are also trimmed in Alcantara and the headlining design was continued to the front. A specially designed centre console was fitted in the drivers cab to match the passenger cabin. But the V-Class still has plenty to entertain you, with two TV screens, Apple TV and WiFi. You can even connect USBs or tablets to the screens for work on the go. The comfort doesn't stop with the trim and entertainment, we have included fold out tables for extra comfort. We included reclining seats to relax when you need to and individual blue and white comfort lights for work or relaxation at the end of the day. Speak to us about trialling our V-class demo or about designing your own unique V-Class.